President Mnangagwa yesterday exhorted the country’s security forces to use the skills and knowledge they are acquiring in various training programmes to build the Second Republic. Officiating at the graduation ceremony of 66 officers under Joint Command and Staff Course No. 31 at the Zimbabwe Staff College, President Mnangagwa said everyone had a role to play in the Second Republic. “I am confident that this course has adequately equipped you so that you find future appointments surmountable as you play your role, with determination, in the building of the Second Republic,” he said. “I am confident that this course has equipped graduands with the requisite skills to proficiently carry out their constitutional duties. I challenge students to use the knowledge they acquired during the 46 weeks of this course. 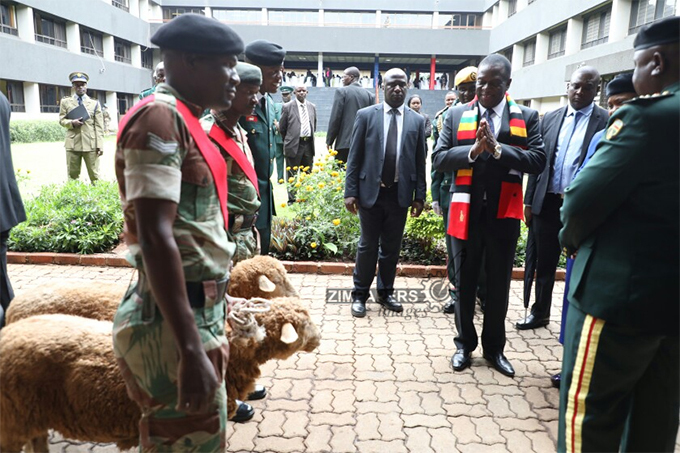 President Mnangagwa expresses his gratitude after being gifted two sheep. Joint Command and Staff Course No. 31 began in January this year with 67 students, but one failed to complete the course. The students were drawn from the Zimbabwe National Army, Zimbabwe Republic Police, Air Force of Zimbabwe, Zimbabwe Prisons and Correctional Services and the President’s Department. Other participants came from Botswana, Malawi, Tanzania, Swaziland, Zambia and South Africa. President Mnangagwa said synergies with Sadc member states were commendable. No single country, he said, had a monopoly of ideas and knowledge about peace and security issues. “Such interactions facilitate the cross-pollination of ideas and experiences, cultivate mutual trust and partnerships,” he said. “The Joint Command and Staff Course remains significant in the current development impetus of our country, given the nexus between national security, peace, stability and economic development. “Apart from the multi-faceted spin-offs such knowledgeable, skilled and competent officers, these courses also contribute to our nation’s overall human capital base. I am encouraged to note that the curriculum of the Joint Command and Staff Course programme is continuously being reviewed to include the totality of our national ethos and values. President Mnangagwa said external study tours undertaken by the security officers were key as they broadened the students’ conceptualisation and comprehension of political, economic, cultural and civil-military relations that exist in different parts of the world. “These exchanges further promote an in-depth appreciation of the country’s history and experiences in the context of the broader environment and helps to guide how we relate and interact in the comity of nations,” he said.